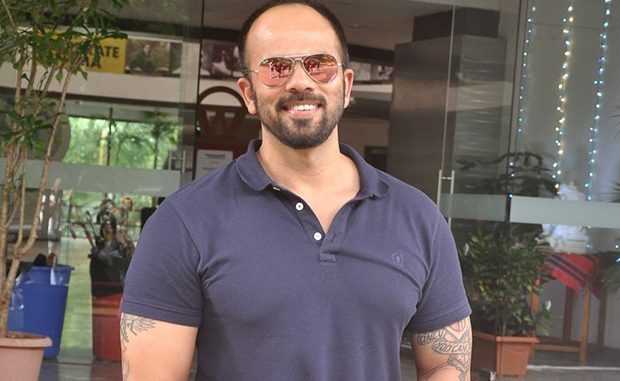 Rohit Shetty is a unique filmmaker. He’s driven by his heart, has a crackling sense of humour, is extremely hard working and believes in being himself in any given situation. The IFTDA Masterclass held in Mumbai yesterday with Rohit was just like his movies. Larger than life filled with emotions and was a blockbuster success. There was a rousing reception as he came on the stage. The moderator for the evening was Sudhir Mishra but it was Rohit who set the rules. He insisted that he wanted a longer interactive session with the film students who were part of the audience. He got up from the seat and ensured that he makes an eye contact with each and every one who asked him a question. The laughter flowed in abundance but he didn’t put down anyone. Even the aspiring actors and possible assistant directors were given a patient hearing. As he left the stage, he received a standing ovation and in an hours’ time Rohit Shetty was trending on Twitter. I spoke to Rohit before the masterclass and he vented his heart out in an unadulterated fashion. Whoever has seen you working or whoever has worked with you know you have a very strong team and you guys closely work together and you’ve helped out a lot of people from your team as well. In many ways many people have learnt from you. In this masterclass there will be a lot of students as well, how important is it for you to pass on the knowledge that you’ve acquired over the years? I am looking forward to it, the best part about it that it’s not commercial. There won’t be media all around, there won’t be agenda ke what are we going to get for tomorrow’s headline. So what I like is it’s going to be heart to heart conversation. It’s going to be purely about cinema and experience. It’ll be not only on a serious note but on a fun note also. I am looking forward to creating a lot of positive energy around and because people who have come are students they are from industry, they’re assistant directors; they know how it works and what the reality is. So it’s going to be a totally different conversation than any other thing like you release your promo the most stupid thing happens is nobody is asking about the film. You see any channel, any video, the actors, director, technicians will come, they have shown you the first look and there is no Q&A of your film. So now actually we’ll be talking about films. Shah Rukh, in the last 20 years has never done this, he didn’t have a media conversation yesterday on his birthday because somehow the questions would’ve been to con him and then the misquoting game begins. It’s only that we’ve got tagged, few of us, directors, that we’re commercial but everyone is commercial, everyone wants to make the headline and their subscription to grow, and everyone wants some meat in it. It’s just that ke hum log badnaam hai ke hum commercial films bana rahe hai. Sabhi log commercial kaam kar rahe hai. Har aadmi flavor of the season ke question puchte hai ke kya flavor chal raha hai and uske hisaab se log jawab bhi dete hai ke Twitter pe gaali padegi ke nahi kisko support karna hai us hisaab se interact karte hai log. Rohit, we’ve interacted since many years now you’ve spoken about the entire journey. You’ve had an eventful journey since teenage. You started assisting movies at a very early age. Have you ever thought that you’d want to make a film or maybe someone else can make a film taking your own story into account because there’s a long story that you’ve had as well? My own will be a TV serial, not a story because you won’t be able to say in two hours (Laughs!). I don’t think so but it would be quite interesting, I’ve seen lots of ups and downs, I’ve always been fighting against the wave. You don’t get good reviews, you don’t get praised but you’re still fighting and making your audience, have a fan base outside and people who love your cinema. Okay, talking about the headlines, you’re quite good at that and we were just talking about the headline you’ve given recently about Golmaal 2 being a crap film? So why will you say something like this about your own film which has done exceptionally well at the box office. So, are you saying I should not have been honest? I’m just asking you because usually film makers don’t do this. I’ve been honest and you know it has been a cut paste media now, morning one person will write something and by evening not a single word is changed for all the sites. Few journalists ask me why you’re doing south remakes. I say you all are doing the same thing morning kisi ne likha hai wahi aap cut paste karke likhte ho and if you go and do the history everything is on record since 2010 I’ve been saying that one film I don’t like of my own is Golmaal Returns and you can check it. I’m surprised by MAMI ek taraf reh gayi aur main ek taraf reh gaya. Okay, you’re making Golmaal 4 now, everyone is talking about it lot of speculations about who’s the heroine is going to be. No, we’ll finalize the girl and announce it in a big way, Ajay is busy with Shivaay, once that’s over then definitely we’ll announce the girl. We’ll start in the end of January 2017. You’ve seen Shivaay, what do you have to say about the film? I loved the film; I loved the action and CG. Ajay has always been a great director; he has been a great technician, it is not suddenly that he felt like he should direct a film. It has been there even when we were making Pyaar Toh Hona Hi Tha or Raju Chacha with him and I was associate director. We’ve learnt a lot from him and he always wanted to be a director. Very few people know that he was an assistant director also; he has assisted Shekhar Kapoor and many other guys also. What do have to say about this initiative of IFTDA getting all the directors together and just celebrating them and letting them share their thoughts without entire taamjhaam of too much flash bulbs? It’s a great initiative, I wish when I was an assistant director there was somebody like Ashoke Pandit and now people who we have head of our team, our association, I feel when I was an assistant director I would’ve loved to have an interaction with Mukul Anand or a Ramesh Sippy. So it’s a good initiative and I think it’s high time that directors come out and we have association growing and talking about our work. Rather than what has been printed in newspapers and then them not getting to know our real selves. All the assistants can’t work with one director so I think this is a great initiative taken by association.. Anything on Ram Lakhan remake? Do you think it’ll be made? No, not now. I want to end it on this note, else tomorrow morning there’ll be nothing of the event and there will be only Ram Lakhan (Laughs! ).